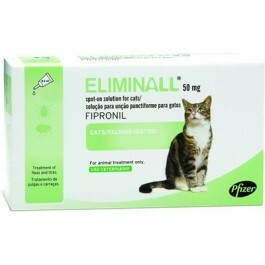 Eliminall has a persistent insecticidal efficacy for up to 4 weeks against fleas (Ctenocephalides spp.) and acaricidal efficacy for up to 4 weeks against Ixodes ricinus and for up to 1 week against Dermacentor reticulatus and Rhipicephalus sanguineus. Ticks will usually be killed within 48 hours. However, if ticks of some species (Dermacentor reticulatus and Rhipicephalus sanguineus) are present when Eliminall is applied, all the ticks may not be killed within the first 48 hours but they may be killed within a week. Eliminall can be used as part of a treatment strategy for the control of Flea Allergy Dermatitis (FAD), where this has been previously diagnosed by a veterinary surgeon.